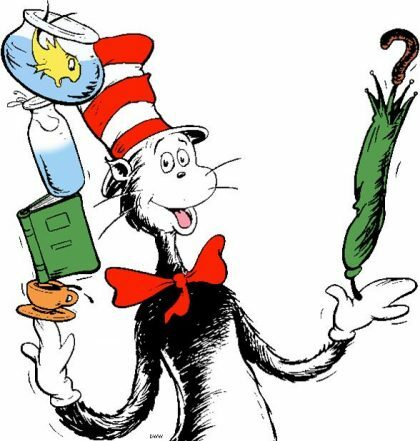 Dr. Seuss, himself a Unitarian, has written a treasure trove of stories for young children that serve as wonderful resources about our UU principles and values. Although highly entertaining, the stories contain profound lessons for children of all ages, based on life situations that we all experience. The meaning of our names is discussed in this story of the complications that arise when Mrs. McCave calls all of her 23 sons “Dave”. The King asked for something new to come from the sky and received oobleck, which created quite a mess. The King’s apology was needed for the oobleck to disappear. The rabbit and the bear were arguing about who was better. A worm helped them answer the argument. People on one side of the wall buttered their bread on one side; people on the other side of the wall buttered their bread on the other side. Each side saw the other side as a threat and created bigger and better weapons. Would this escalation ever end? Taking responsibility for our own actions. Fanciful creatures and places with letters created beyond z. Various fanciful and real ways people get ready to go to sleep. The small character meets a pair of pale green pants in various places, and finally realizes that the pants are as scared of him as he is of them. She likes to sit and think up things, but her thinking got out of hand, and it took her brother to help her un-think some thoughts. Be willing to try new things, like green eggs and ham. A young boy weighs the pros and cons of possessing various animal appendages—such as a duck’s feet, a deer’s antlers, a whale’s spout, an elephant’s trunk, and a long, long tail—only to decide that he’s better off just being himself. Various whimsical situations are given to show that there are situations far worse than those of the reader. The Grinch wanted to stop Christmas from coming. Did he succeed? Everyone is important and deserves to celebrate their birthday. Gertrude wanted to be like another bird and got more than she wished for. What motivates you to get up, and how do you handle troubles that come your way? How do you respond when you have a task that seems overwhelming? There are many things to read, and ways to read. A boy is fishing in a small pool, imagining all the kinds of fish that he might be able to catch. All types of adventures, good times and not so good, and lots of thing to think. One group of Sneetches feels superior to another because of stars on their bellies. When the other group of Sneetches feels left out, Sylvester McMonkey McBean uses a machine to add and take away stars, with the Sneetches paying for the changes. What happens when the money runs out? The King’s day was balanced between work and play, until Lord Droon took away the stilts. Horton has a hard time convincing others that he has heard a voice on a speck of dust. He has a hard time protecting the Whos. The Whos have to cooperate in order to make themselves heard. What makes a “good” day and what are your reasons for getting up? Sometimes, it’s hard to make up your mind, but sometimes you just have to do it! Horton agrees to set on an egg while the mother takes a vacation. Through trials and taunts, Horton sits on the egg. The Once-fer traded the forest for business opportunities with dire results. Can the environment be saved? A daisy grew out of Mayzie’s head. Why? How? And how could she get rid of it? King Louie Katz got another cat to hold his tail up, and that cat got another cat to hold up his tail . . . and on and on until the last cat, who had no cat to hold his tail, quit. Yertle decided that he needed to enlarge his kingdom by putting his throne higher, literally on the backs of other turtles. Two Zax meet and refuse to move to let the other pass.